• One of first noted visitors Ponce de Leon, who anchored ship off island and scraped barnacles from vessel in 1513. Expedition withstood attack by Timucuan Indians; one soldier killed, denoted as the first European battle casualty in North America and depicts the first use of artillery in the Tampa Bay area. • In 1528 Spanish explorer Panfilo de Narvaez landed on west coast of Florida, believed between St. Petersburg Beach and Clearwater. • In 1539 fellow Spanish explorer Hernando De Soto (fort namesake) came ashore on or near the south portion of Tampa Bay. De Soto’s exploration of the southeast U.S. would explore more than 4,000 milesand result in numerous Native American attacks with 10 ships and 700 men. • 667-acre unincorporated portion of Pinellas County. Once consisted of 15 islands used for centuries byNative Americans for ceremonial and burial grounds. Considered sacred ground to Native nations as far back as 500 years ago, and deadly conflicts occurred when outsiders trespassed, according to archaeologists. • Indian middens (shell mounds containing artifacts) have been identified around key. Marker on east side of Pinellas Bayway denotes where Native American relics found in typical shell mound, excavated when the road was built to Fort De Soto Park. • Ponce de Leon returned in 1521 to start settlement and seek revenge on Indians. Challenged and mortally wounded by Native Americans; later died in Havana. • In 1849 group of United States Army Engineers, including then-Brevet Col. Robert E. Lee (later commander Confederate Army), surveyed coastline for possible use as coastal defense area, recommending Egmont and Mullet Keys for military utilization and prohibiting private use or development. • Though no fortifications were in place during theeventual Civil War (1861-1865), Union troops temporarily occupied some of islands to prevent movement of Confederate troops through Tampa Bay. • Sites abandoned in the wake of the Civil War until 1882 when the military reestablished its presence on Mullet and Egmont Keys. • In 1898 U.S. involved in conflict in Cuba, which led to Spanish-American War. Citizens of Tampa Bay demanded military defenses and construction of the fortifications on Mullet (Fort De Soto) and Egmont (Fort Dade) Keys ordered. • Pinellas County briefly purchased Mullet Key from federal government in 1938, but in 1940 War Department briefly decided to re-militarize as bombing range; became subpost of MacDill Field in 1941 and used throughout WWII. • In 1948 Mullet Key sold back to Pinellas County. • Nearly 1,000-acre Fort De Soto Park, including historic fort, officially designated in 1963. • Location on southwest tip of island selected as site for class of armament comprising 12-inch mortars, to be fired simultaneously in artillery battery. Designed so that enemy ships would not be able to see the gun emplacements since the batteries facing the Gulf of Mexico were buried in sand and vegetation. Though never used in combat, fort remains significant in terms of evolution of modern weaponry. • Construction on 613-acre military installation began in late 1898, including 275-foot wharf extending into Tampa Bay. Shell-concrete formula used infoundation because stone shipment delayed; stoneeventually added to shell, sand and cement mix to complete the construction of the walls and ceiling. • Named Fort De Soto in 1900 after Spanish explorer. Officially subpost of Fort Dade on Egmont Key, neither of which saw combat. o Battery Laidley and Battery Bigelow – Laidley (in honor of Col. Theodore T.S. Laidley, who had served in the Mexican and Civil Wars and died in Florida) featured new design for military to improve coastal fortification with thick walls and ceilings camouflaged using massive amounts of dirt; able to withstand direct fire of a ship’s weapon, walls ranged from 8 to 20 feet thick. Each of two gun pits housed four 12-inch mortars. Remains and last four 12-inch M 1890-MI mortars remaining in North America still visibleat site. Secondary battery Bigelow (in honor of 1stLt. Aaron Bigelow, killed in the War of 1812) destroyed by hurricane of 1921.
o Historic original brick road built in 1898 uncovered from parking lot to weapons. o Placed on National Register of Historic Places in 1977.
o Also houses two 6-inch rapid-fire rifles from Battery Burchsted on Egmont Key that were part of armament of Fort Dade. Transferred here for preservation after gulf shoreline of Egmont Key was eroding severely and weapons in danger of being lost. • Twenty-nine post buildings constructed between early 1900 and 1906, including 100-foot-long barracks, hospital, stable, guardhouse, blacksmith and carpenter shop, administration office, mess hall and kitchen, bakehouse and storehouse. Brick roads, concrete sidewalk and narrow-gauge railway tracks for moving materials around post also constructed. • At peak housed up to125 soldiers; approximately 1,500 total throughout its history. Enlisted men served five-year tours on island. Officers stayed for year. • In 1900 garrisoned by a detachment of Company A, 1st Artillery. Later known as 1st Company was replaced in 1907 by 39th Company, Coast Artillery, which stayed at fort for three years. • Post active from 1898 to 1910. Fort designationchanged several times over years, from sub- to independent post. From 1901 to 1909 used for joint maneuvers and training exercises by various local and national troops. • By 1914 only one sergeant and game warden from the Department of Agriculture remained on island. • Activated as a Coast Artillery Training Center in WWI and used in WWII as an Air Force Gunnery andBombing Training Center. o WWII-era bombs discovered buried underground in 1980s. • In 1923 both Fort De Soto and Fort Dade abandoned;one caretaker remained at each post. • Soldiers endured heat, unrelenting mosquitoes, boredom while stationed at fort. o Humid summers posed threat of sunstroke and dehydration. Until early 1900s uniforms were made of flannel, kersey or other woolen fabrics. During summer drills, Fort De Soto garrison endured misery from wearing the heavy uniforms in stifling heat. ▪ Sgt. Charles L. Scott, 27, committed suicide in 1902; buried in (now defunct) Fort Dade Post Cemetery. ▪ Near-death experience of soldier who was severely injured in gun pit at time first mortar fired reported; subsequently transported off island and believed to have died from injuries at later date. about 1937 where immigrants were examined and treated before being allowed into U.S.
o Station had 15 buildings in 1925. In 1933, the Public Health Service began mosquito eradication on the portion of Mullet Key that the Army had occupied. • Coast Guard buoy tender Blackthorn and 10,000-ton oil tanker Capricorn collided three-quarters of a mile west of Sunshine Skyway Bridge, killing 23 Coast Guardsmen in worst peacetime disaster in Coast Guard history. • During Civil War “Unionists” (those who wanted Florida to remain part of U.S.) under protection of the U.S. military as the Navy had a supply station on Egmont Key. Islands garrisoned by federal forces as blockade headquarters for area and haven for Union sympathizers. (Sarasota Herald Tribune, 5/1/1972) According to Navy documents, Daniel “Scott” Whitehurst and his first cousin, John Alexander Whitehurst, attempting to get off beach into boat at Boca Ciega Inlet after having obtained food from their home farms to take back to Egmont Key where their families were living as refugees. Pair shot by Confederate sympathizers. Scott (1829-1862) fatally shot on the sand and body later buried in an unmarked grave on Mullet Key. John able to get to boat and paddle out into Tampa Bay, where he was found the next day by another Union sympathizer.Taken back to the refugee encampment on Egmont Key and died there the following day. John originally buried in the small cemetery on the island that is next to the Egmont Key lighthouse. In 1909, all Civil War burials were moved to the National Cemetery in St. Augustine, Fl. • Series of burial mounds in Fort De Soto Park where three massive whales, as well as dolphins, manatees and sea turtles have been interred. • Nearby Egmont Key home to Fort de Soto’s twin, Fort Dade, located less than mile apart. U.S. military internment camp for about 300 Seminole Indians in the mid-1800s located on Egmont Key. Seminoles who died there buried without markers. o Reports of people jumping though bodies never found. • Rapid deterioration after abandoned and wave damage to Battery Bigelow. Hurricanes of 1921, 1926, 1935 result in costly damage to post buildings. In 1932, battery collapsed into Gulf of Mexico. • As sun begins to set, hushed voices can be heard echoing off walls of the southernmost bunker. • Phantom footsteps and apparition of a dripping wet, fully clothed man appears at fort; variation of wet soldier who drags himself out of ocean and walks, dripping, throughout fort. • Footsteps heard in fort’s small powder room. 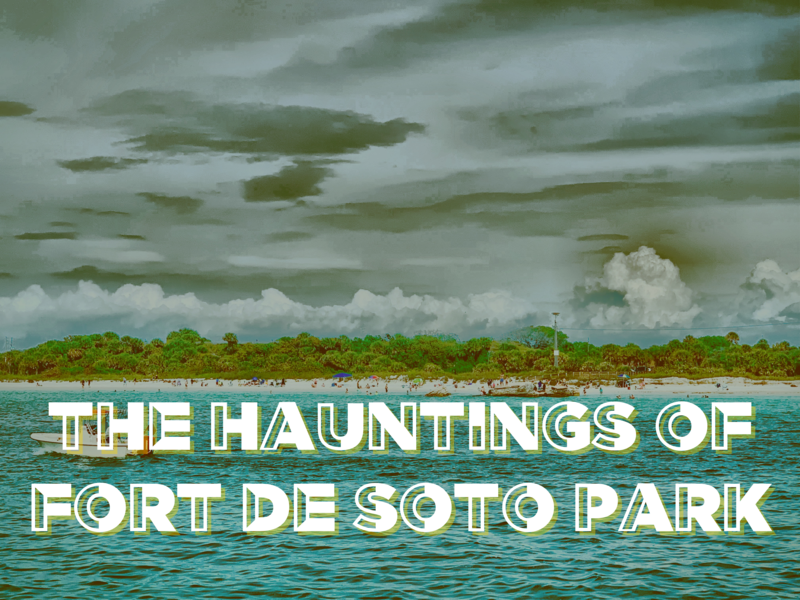 • Near Fort De Soto Park toll plaza, ghost of the“Friendly”/Trout Fisherman seen wading in water in the grass flats; fond of interacting with women and disappearing after brief conversation. • Ghost of woman quarantined on Mullet Key who wentinsane at news of her dead children who all died from Yellow Fever; said to cry out and search for them. o Female reported by witnesses as appearing to be preparing to jump, though no woman ever found; variation of female who did make jump; or tollbooth workers/motorists who would see woman hitchhiking and upon picking her up notedshe became extremely nervous in the car, wanting to get to the other side and eventually vanishing. o Witnesses claim that while visiting fishing pier, once location of original bridge, seeing “ghost bus” traveling near them; many claim to feelactual breeze and catch whiff of gasoline; ghost of elderly woman seen at rear of bus, grinning and waving as bus plunged downward. Special thanks to Eunice Specter for her historical digging.